A key strategy for identifying ‘fake’ or misleading ‘news’ is to look for weasel words. I put fake and news into quotation marks because weasel word writing is common in the most prestigious news sources, especially in the op-ed columns. 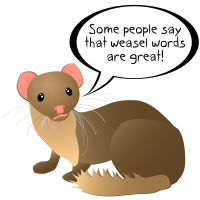 Wikipedia has a good list of weasel phrases to watch out for. When writing, be specific. When reading, look for writers who use specific language and avoid generalizations and vague pronouncements. Posted on December 8, 2016 by patadavePosted in Politics, The PresentTagged News, Weasel Words. Previous Previous post: Why don’t we have colorful streets?